You, Me and Movies: Colin Farrell makes a good "Lobster"
Colin Farrell makes a good "Lobster"
In a near future, if you are single, you are taken to a hotel. You get to spend the next forty-five days at this hotel. Your purpose at this hotel is to find a romantic partner to spend the rest of your life with, the hotel will know when you've found your permanent partner when they see that this partner has something in common with you. If its been forty-five days and you still haven't found a romantic partner, the hotel will turn you into an animal of your choice. Yep, in the future, you have forty-five days to find someone to spend the rest of your life with, or spend the rest of your life as your favorite animal. Weird, huh? Don't want to have a time limit to find love? Don't want to be at the hotel, period? Go ahead, try and escape. They will catch you. The residents of the hotel use tranquilizer guns to fetch the runaway residents back, and get additional time at the hotel for it! To call "The Lobster" a weird movie would be an understatement. Weird, to me doesn't mean bad. I don't think any idea is a bad idea for a movie. It all depends on how its directed, written, acted and created. 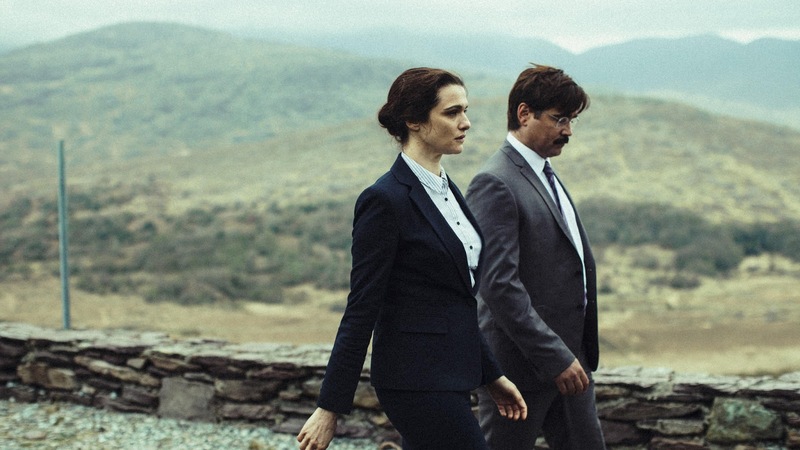 "The Lobster" works because its quite funny, not in a slapstick way or even a offbeat way. "The Lobster" is an absurdist comedy, a type of story where the hero (in this case, David played by Colin Farrell) can't find purpose in life. When we meet David, he feels like his life is over. He will find nobody to love him, his dog is actually his brother, who couldn't find a romantic partner. As he trudges along at the hotel, he makes several friends (John C. Reilly and Ben Whishaw, in particular), but very few candidates to fill the void of his love life. He never seems particularly happy either. Its also funny because David decides that if he can't find love, he wants to become a lobster. Because they can live a long time and he loves the sea. Not bad, eh? The entire movie revolves around his experience at this weird hotel. A hotel where masturbation is banned, but sexual stimulation by the hotel's maid are mandatory. Where opportunities are made for you to meet your potential partner. Where people leaving the hotel can do anything they want on the last day before they become an animal. Its a silly, silly world, but it feels profoundly believable. Colin Farrell sells his character, he allows himself to slide right into this very silly world. It feels authentic, and it feels like a real place, something that is non-fiction. Its a surprisingly powerful performance by Farrell and one of the best things he's done in awhile. Not that he's alone, as John C. Reilly and Ben Whishaw are both exceptional here. Rachel Weisz shows up and delivers a good performance. Lea Seydoux, who you may remember from "Spectre" last year, does incredible work here too. It is a beautifully acted experience and the cast helps you buy into the absurd world their characters inhabit. My only real gripe is that the film lags a bit too much in its final half hour. So much so that I could feel myself loosing interest. It almost seems like they didn't really know how to end it. I wish things didn't slow down so much in the final stretch, because everything leading up to that stretch is beyond fascinating. This is a deep portrayal of what filmmaking is about. Creating worlds we'd never really see and making us buy into their premise. "The Lobster" will allow you dream big, to make sure you aren't afraid of your ideas, no matter how strange they may be, because strange doesn't mean bad. I doubt we will ever live in a world where we are forced to find love or be turned into an animal, but I believe in a world like that now, thanks to "The Lobster"
Brad Pitt and Marion Cotillard dazzle in "Allied"
Jack Reacher: Never Go Back...to the theater!